This recipe comes from my husband Blake. We call him The Grillmeister around here, as he turns out some mighty fine fare on his backyard Weber grills and Big Green Egg. Blake’s “farmboy” upbringing is the perfect compliment to this site, not to mention our marriage. He grew up in a farm family, just like me, about 50 miles north of where my family lived. 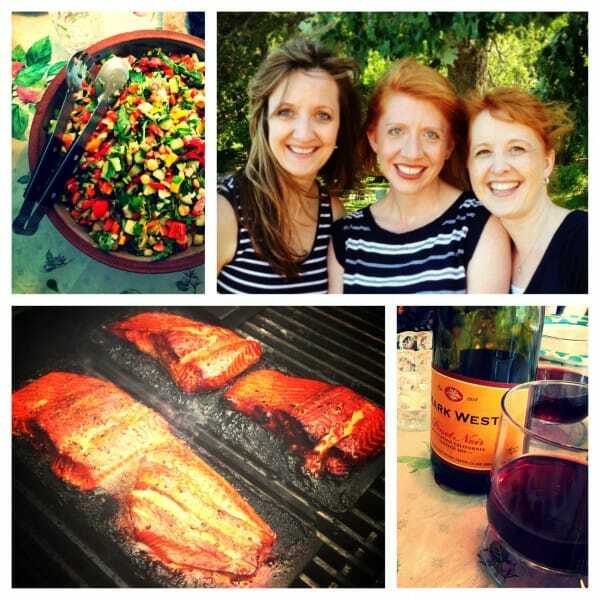 Blake and I started experimenting with grilled salmon many years ago, before the kids were ever in the picture. Blake first used a fish grill basket or placed the salmon directly on the grill grates. But he always had mixed results with attaining a pretty presentation on the table. He wanted something more dependable, and started playing around with cedar grilling planks last summer. The Grillmeister very quickly converted to this method for salmon. 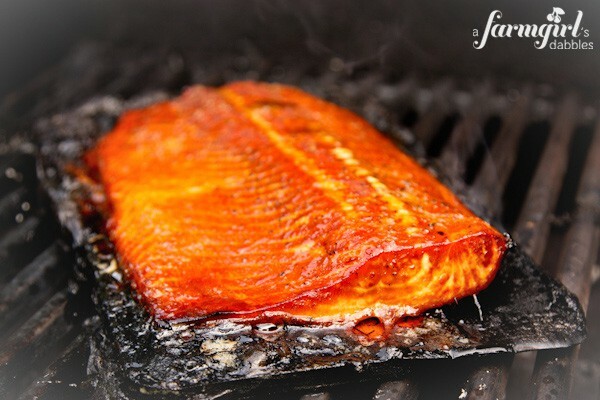 Grilling planks are the perfect solution for presentation, plus they yield a moist piece of fish with a lovely smokiness. 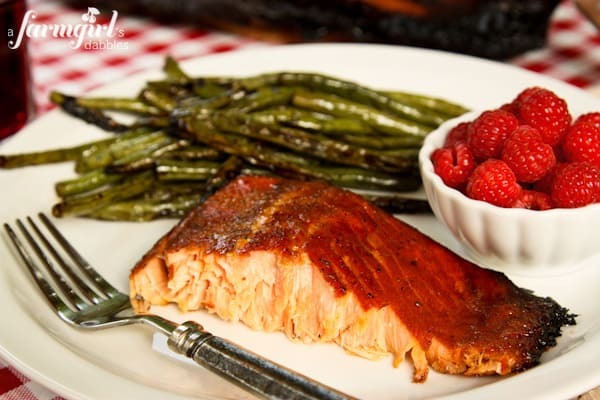 This uber awesome Sweet and Smoky Grilled Salmon is a meal that Blake has been making for our family since early this spring. We’ve served the leftovers to Mom (it’s not our fault she said “don’t plan on me being there for supper”…just lucky for her, there WAS some left when she arrived!) and, most recently, to my two sisters and their kids when they visited for a few days. And everyone has melted in pleasure over its moist and tender, sweetly caramelized deliciousness. My youngest sister Jessica started a summer tradition last year of gathering all our kids together for a few days. She invited everyone to their home last summer in South Dakota, so this year we planned the social event of the summer at our house in Minnesota. Our girls have referred to it as the “Cousins Retreat”. These seven kids had so much fun together! An overview of their days…swimming at super clean and clear Square Lake, and then heading to beautiful historic downtown Stillwater to dine at DQ, pick out a little bag of old fashioned candy at Tremblay’s Sweet Shop, and play at Teddy Bear Park, every young child’s dream park. They played made-up games outside for hours, went for walks, and giggled themselves to sleep in the bedroom with the sign on the wall that read “Cousin Hangout”. 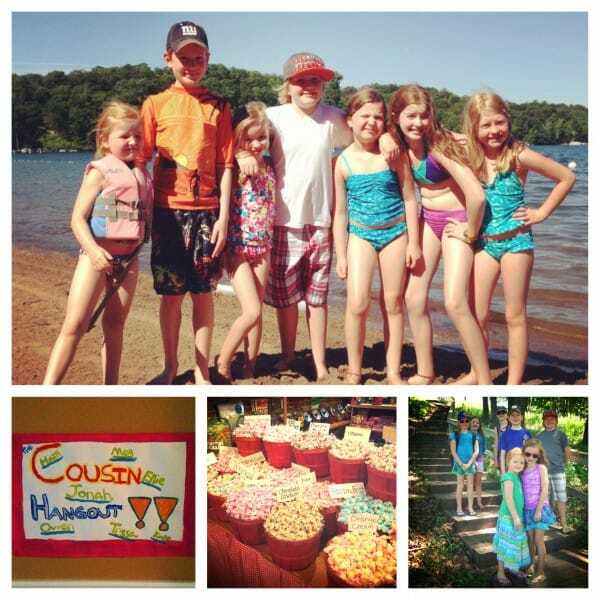 But this was not just a cousins retreat. Oh, no. I like to think it was a “Sisters Retreat”, first and foremost. Cheryl, Jessica, and I have far too few days during the year when we’re all together at the same time. So these were some very special days to catch up on life, take walks, share a morning latte, and enjoy some wonderful food and a bottle of wine each evening. Blake’s salmon was most definitely a hit. 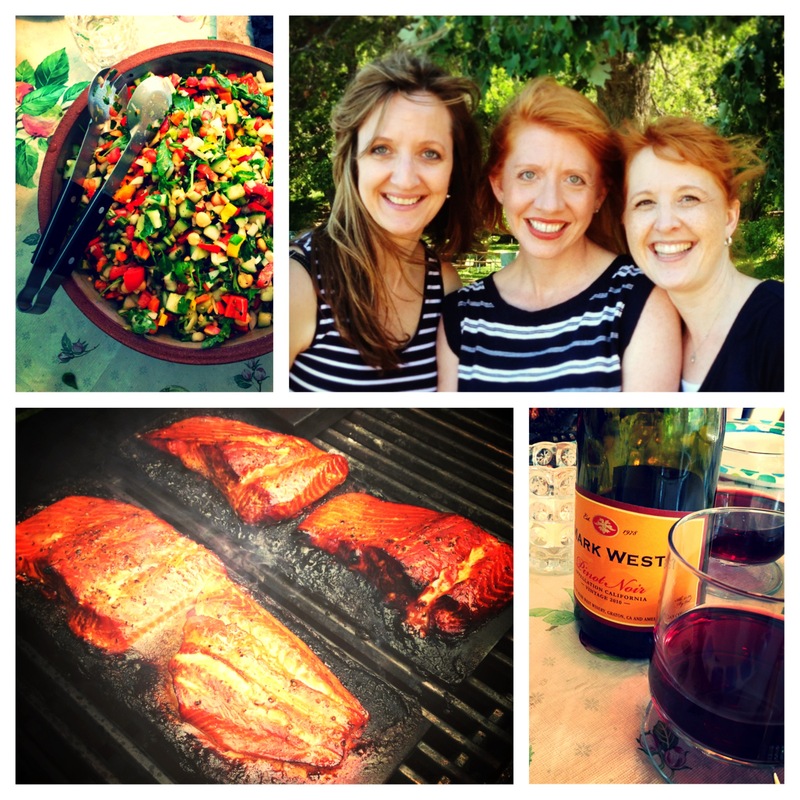 And I’ll be sharing that gorgeous chopped salad (upper left photo) recipe yet this summer, too! 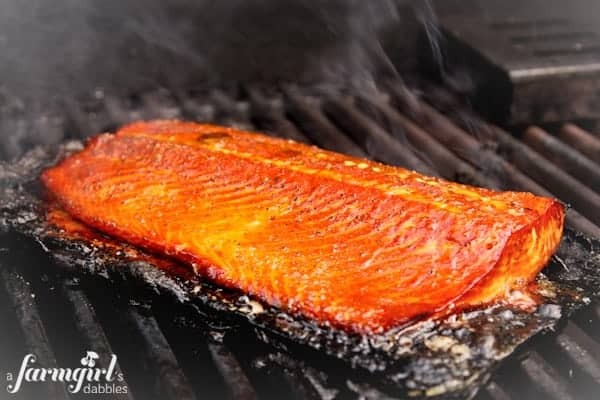 When Blake and I first started playing around with grilling salmon all those years ago, we knew that including maple syrup was one of our very favorite methods of preparation. We loved the sweetness that it added, but most importantly, the caramelization and texture. And then this spring, when Blake got more serious about perfecting a go-to recipe for us, he sprinkled on this fabulous Bourbon Smoked Sea Salt that I brought home from my trip to Louisville, Kentucky last year, when I was a guest of GE Monogram. The smoked salt comes from Bourbon Barrel Foods, an amazing company I was able to tour in the heart of Kentucky bourbon land. Bourbon Barrel Foods microbrews small batches of Bluegrass Soy Sauce, fermented and aged in re-purposed bourbon barrels. And it’s so good! 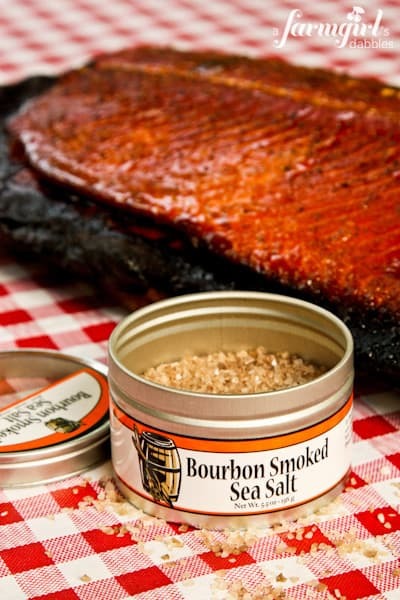 They also produce many other wonderful food items, such as this bourbon smoked sea salt. You can order it directly from their site for this recipe, or use your own favorite smoked sea salt. I’m telling you, this has been one of my very favorite meals this summer. I don’t think it’s possible to mess this salmon recipe up. It always turns out perfectly moist, with a sweet and slightly smoky flavor. And the salmon comes away from the board almost like magic. It’s a beautiful thing. We love to serve the salmon straight from the plank, such a fun presentation on the table! 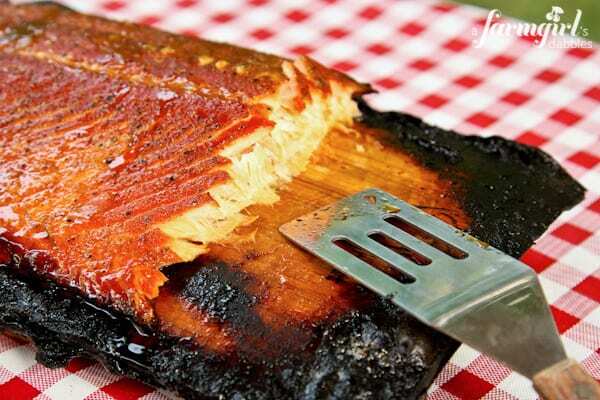 Do you use grilling planks for salmon? I’d love for you to share YOUR favorite recipe with us! Place grilling plank in a 9”x13” pan and pour 1 to 2 cans of beer over it, so that top of plank is covered and wet. Set a heavy glass or bowl on top of the plank to keep it submerged. Set aside for 2 hours. About 45 minutes prior to grilling, prepare the salmon. Place salmon in a separate 9”x13” pan or similar dish, and then sprinkle the fillet evenly with smoked salt and a good dose of freshly ground black pepper. Then sprinkle with brown sugar, patting it gently onto the salmon. Next slowly drizzle the maple syrup over the brown sugar, letting the syrup soak into the brown sugar and salmon. Set aside on the counter to marinate. When the grilling plank is done soaking, preheat grill to 400°. Drain and discard beer from pan holding the plank. Set plank back into same pan, and then place marinated salmon onto the plank, to carry out to the grill. 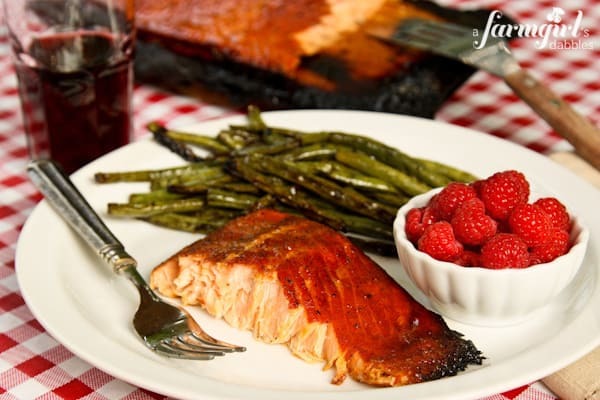 Set plank with salmon directly onto the grill grates and shut grill. Don’t peek until it has been cooking for 15 minutes. Depending on the size and thickness of the salmon, cook for about 20 to 25 minutes total. And don’t be concerned if the plank starts to smoke, that’s a good thing. A very good thing! 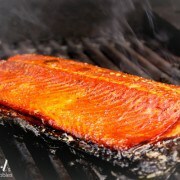 The salmon is done when it is deeply bronzed as shown in the photos, and any surfaced oil deposits have been cooked out. You can also insert a fork into the thickest part of the salmon. If it flakes easily, it’s finished cooking. Serving the salmon straight from the plank makes for a great conversation piece at the table and is so fun to take your portion from. The plank does get quite charred, however, and you may want to place a platter or pan underneath the plank to save a pretty tablecloth. Notes: Blake has made this with and without the skin on. It works great either way. The photos in this post depict a fillet without skin, and the salmon comes off the plank very easily. When using fillets with skin, place the fillet skin side down on the plank. The skin will somewhat stick to the plank and allow you to very easily remove and serve the salmon.